Honda HRS Series Mowers are self propelled and push lawn mowers with standard mulching and side discharging design features. 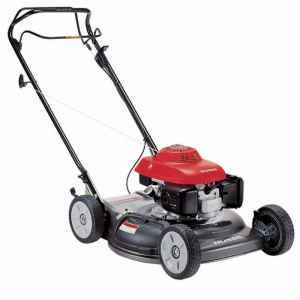 Honda HRS Series Mowers are one of the entry level push lawn mowers in the market. Honda delivers the commitment of reliability, durability, quality and long lasting performances of the machines. Honda manufactures lawn mowers with great engine technology, great cutting edge technology and solid built mowing decks. All these features are offered by Honda at a terrific price value. HRS series mowers are built with 100% quality and engineering skills meeting the requirements of the users. Other than lawn mowers, Honda has consistently maintained a reputation for manufacturing cars, trucks, SUVs, power sports, jets, power equipment, marine equipment, racing, etc. Honda HRS Mowers are self propelled and push lawn mowers with standard mulching and side discharging design features. These lawn mowers are light to handle and manoeuvre and are efficient machines giving best performances. Honda line of comprehensive products supports 4 stroke engines. If you happen to visit the official website of Honda, you would see a variety of product ranges offered by the Company. Honda also offers the option of buying lawn mowers online and can be collected or delivered by its partner dealers near your town. HRS Series Mowers from Honda are forms of walk behind lawn mowers and types of gas powered push mowers and self propelled mowers. They are the advanced and modified versions of the traditional push lawn mowers. HRS216K3PDA is a push lawn mower and HRS216K3SDA is a self propelled lawn mower. Self propelled lawn mowers are one of the expensive forms of walk behind lawn mowers. They are of two types i.e. rear wheel and front wheel self propelled lawn mowers. Self propelled lawn mowers emit more pollution than 11 cars per hour, so usually propane or gas lawn mowers are not recommended. On the other hand push mowers take much force to use but are good for exercise and they need less maintenance as compared to self propelled lawn mowers. There are two models of Honda HRS Series Mowers having similar features except a few. twin-blade mulching, spark arrestor, etc. 0.29 gallon fuel capacity and six different mowing adjustable heights facility. The other models of Honda HRS Series Mowers include HRS216SDA which has similar features like HRS216PDA. It also supports GCV160 OHC/OHV engine which minimizes the emissions that are harmful for the environment. a 2.5 mph ground speed which the other model does not support, 0.29 gallons fuel capacity and again six adjustable cutting or mowing heights. The Flywheel brake blade control means that lawn mowers will stop in the absence of the operators. Some of the exclusive features of Honda HRS Series Mowers include Zone Start, Ergo-Active Handle, GCV160 engines and also optional twin-blade mulching. The Ergo-Active Handle has the facility of using the lawn mower handle from different positions while mowing. The GCV160 engines are lightweight engines which are environment friendly engines manufactured to serve the purpose of easy to start and minimizing the emissions coming from the machine. These engines are useful because they do not mix up oil and gas, do not make noise to cause ear problems and lasts longer. The price of HRS216PDA is around $389; HRS216SDA costs around $439 and both come with a 3 year residential warranty. People are reviving towards the old and traditional lawn mowers been the safest for them as well as the planet.